Note from Ryan: Use the table below to find the correct exhaust resonator configuration for your car or truck. Not sure which to choose? Follow links to check vehicle fit on Amazon. What is the Best Exhaust Resonator? Vibrant Performance was established in 1997 as a division of Vibrant Power Incorporated, an aftermarket Canadian company distributing and researching heavy industrial parts. The performance division specializes in air induction and exhaust technology for cars, trucks and even motorcycles. Vibrant Performance has grown tremendously over the years and is proud to offer multiple products lines. These items range from performance air filters to fully built exhaust systems. 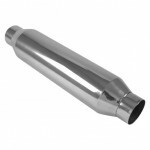 Some other stock and aftermarket exhaust components may produce an unwanted sound. To further tune the acoustics, Vibrant Performance offers one of their most popular products, the Ultra Quiet Exhaust Resonator. 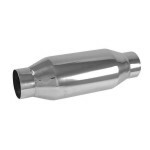 This resonator is applicable to any vehicle that has 2.5 inch exhaust piping, otherwise some modifications will have to be made. The body is both durable and corrosion resistant through the use of T-304 stainless steel. The Ultra Quiet Resonator features a straight through perforated core design to reduce the overall size, and allow for good exhaust flow. Resonator vs Muffler: What’s the Difference? 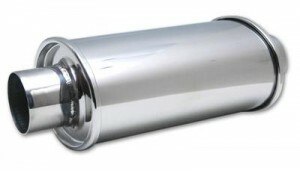 Although it may look like a smaller version of a muffler, resonators are designed to be supplemented into an exhaust system to further tune the sound and not replace a muffler completely. A resonator further dampens the sound but more importantly, it is there to alleviate what is known as “exhaust drone”. Usually during cruising speeds, some exhaust set-ups may exhibit a background buzz that may be heard even inside the passenger compartment. This undesirable effect has been known to cause drivers headaches and nausea along with other health related issues. It is a good thing the Ultra Quiet Resonator is on the market and is backed by a 5 year limited warranty by the manufacturer. 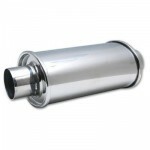 The Ultra Quiet Exhaust Resonator series offered by Vibrant Performance has left a good impression on car enthusiasts. This problem-solver allows drivers to enjoy the sounds of their vehicles without any adverse effects. In a continually changing market, Vibrant Performance continues to adapt to the needs and demands of their customers.